Lay sardines flat on sheet pan, skin side down. Mix all remaining ingredients and spread over sardines. Marinate for 2 to 3 hours. Sauté 2 cups broccoli rabe in a pan with hot oil and let cool. Grill cherry tomatoes until just marked. Stir black garlic into citrusy aioli. Grill marinated sardines very quickly, making sure not to overcook them. Since they are marinated, you need just the grill mark so they take the flavor from grill. Warm lavash bread on grill for a few seconds. Mix black garlic with citrus aioli. Spread black garlic aioli on bread and then top it with broccoli rabe. 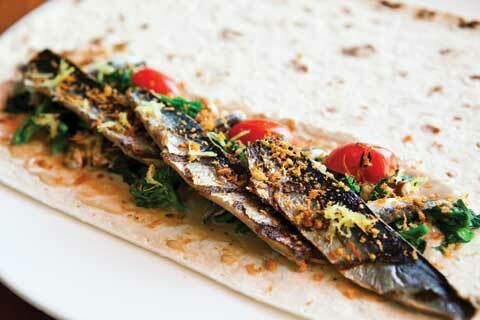 Arrange 4 grilled sardines and 2 marinated white anchovies over broccoli rabe and top with walnuts and grilled tomatoes. Sprinkle with lemon zest. Top with some spicy bread crumb. Roll the bread up like roulade.